Chop all the vegetables. 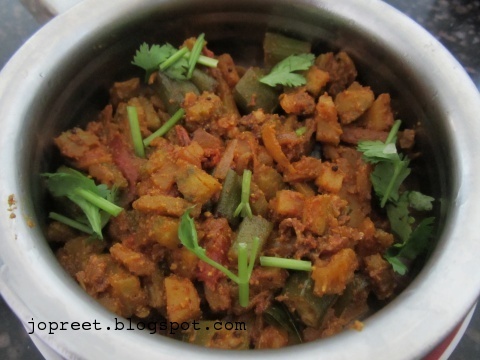 Add little salt to chopped bitter gourd and keep aside for 30 mins. Drain the water and keep aside. Heat oil in a kadhai and temper mustard seeds. 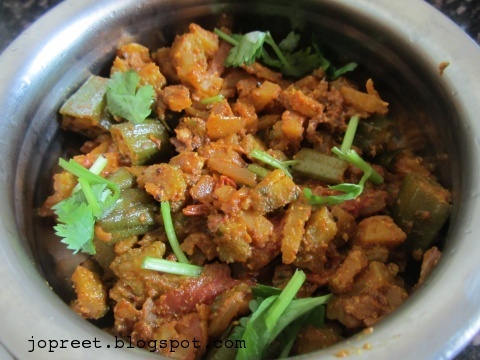 Add curry leaves and chopped onions. Saute a while and add tomatoes. Mash it. Add all the three vegetables, turmeric powder, cumin powder, coriander powder, red chili powder, asofoetida and little salt. Mix all and add curd. Cook it covered for 15-20 mins and stir frequently. Dont add water. Once cooked, remove from the heat and garnish with chopped coriander. Serve with steamed rice. Never combined these both veggis together..Lovely poriyal. Interesting combo dear. Never tried this. hmmmm yummy.